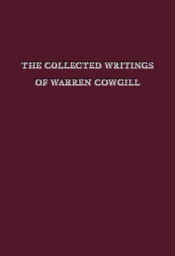 This volume contains all the published articles and reviews, plus a selection of previously unpublished material, by one of the 20th century’s greatest linguists, the late Yale University professor Warren Cowgill (1929-1985). Cowgill’s dazzling mastery of the entire Indo-European linguistic world is on full display, with every work a model of expert methodology and depth of thinking. Two previously unpublished pieces, one on the origin of the z-pronouns in Germanic and the other the full version of his article on the personal endings of thematic verbs in Indo-European, appear here for the first time. The volume also includes over a half-dozen personal reminiscences by former colleagues and students, plus a valuable and engaging autobiographical letter written shortly before Cowgill’s untimely death. Each article has been carefully retypeset and edited to give a handsome and unified look to the volume. Jared Klein, who completed his doctoral work under Cowgill in 1974, is Distinguished Research Professor of Linguistics, Classics, and Germanic and Slavic Languages at the University of Georgia at Athens. He has written widely on the language and style of the Rigveda, and has a special interest in discourse particles in Sanskrit and other Indo-European languages. He is the author of The Particle u in the Rigveda (1978), Toward a Discourse Grammar of the Rigveda (1995), and many articles and reviews.